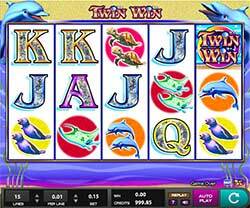 Play the fun undersea adventure Twin Win Slot from IGT and High 5 Games free at Slotorama, featuring 5-reels and 15-paylines! You'll be diving deep below the ocean's surface in this hit slot machine while you go on the search for sea life that will give you an inside look into another world! Play the fun undersea adventure Twin Win Slot from IGT and High 5 Games free at Slotorama, featuring 5-reels and 15-paylines! You’ll be diving deep below the ocean’s surface in this hit slot machine while you go on the search for sea life that will give you an inside look into another world! Split Symbols – Probably the feature leading to the name Twin Spin is the split symbols. You’ll also find this rewarding feature in games like IGT’s Cats slot. The Split Symbol counts as 2 symbols whenever it is involved in a winning combination. All bonus and scatter wins are added to payline wins. All winning combinations pay from left to right except those formed by scatters which pay either way. Twin Win Wilds – The game’s logo symbol is the Wild and will substitute for all symbols including the dolphins, tortoises, sting rays, seals, fish and jack through ace card symbols. When the wild subs for any of the marine life it will count as a double (split symbol). Scuba Diver Scatters – The cutie wearing the scuba gear is the Scatter symbol and will award prizes when you land three or more anywhere on the reels. Getting 3, 4 or 5 anywhere will win you 5, 20 or 200x your stake.